Grab your mates and open throttle on some of the world’s most spectacular roads on the back of a classic Royal Enfield motorbike with this special 15 per cent discount from Extreme Bike Tours. Appealing to the more than one million Australians who ride motorbikes often in clubs or groups, Extreme Bike Tours is offering a special, 15 per cent discount per person on their 2019 ‘Hidden Sri Lanka,’ ‘Luxury Rajasthan,’ ‘Bhutan,’ ‘Madagascar,’ ‘Mongolia,’ and ‘High Himalaya’ tours if you book with three other riders. The special discount is open-ended with no booking deadline. Extreme Bike Tours’ 13-day ‘Hidden Sri Lanka’ round-tour takes riders from the palm-fringed coastline of the tropical island through to mountainous regions filled with tea plantations, ancient civilisations and exotic wildlife. Departing Galle on February 2, 2019, the 13-day tour is US$4208 including the discount – a saving of US$743 per person. The 14-day, ‘Luxury Rajasthan’ tour, lets riders explore India’s largest state at full throttle, visiting ancient forts, wandering nomads, grand palaces as well as India’s most iconic monument, the Taj Mahal. Beginning in Dehli on November 9, 2019, the tour is US$4760 including the discount – a saving of US$840 per person. The 15-day, ‘Bhutan’ tour, takes riders on an adventure through the wide-open valleys and snow-capped peaks of one of the world’s last great Himalayan Kingdoms. The 15-day tour departs from Delhi on April 13, 2019 and is US$5908 including the discount – a saving of US$1043 per person. The 15-day, ‘Madagascar’ tour, offers riders the chance to experience a journey through rainforests and open valleys, taking in views of epic waterfalls and volcanoes along the way. The 15-day tour departs from Antananarivo on June 22, 2019 and is US$4463 including the discount – a saving of US$788 per person. The 11-day ‘Mongolia,’ tour takes riders to the remote country of Mongolia and visits landscapes few tourists ever get the chance to see, such as the lush-forest-steppe Khangai mountain range and Mongolia’s largest river, the Selenge River. The 11-day tour departs from Ulaanbaatar on August 2, 2019 and is US$4113 including the discount – a saving of US$728 per person. The 16-day, ‘High Himalayan,’ takes riders to the northern regions of India, riding amongst the clouds on stunning mountain passes. The 16-day tour departs from New Delhi on July 12, 2019 and is US$3698 including the discount – a saving of US$653 per person. Each tour includes fuel, meals, accommodation and transfers. Flights from Australia are extra. 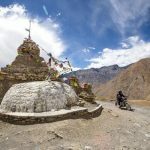 Extreme Bike Tours is one of the world’s leading motorcycle tour companies, offering tours in the Himalayas, Bhutan, Mongolia, Madagascar, India, Sri Lanka and Cuba. * Tours and fares are subject to availability and conditions apply. Prices do not include international flights. There is no booking deadline on the 15 per cent, four-rider offer.